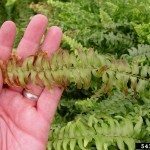 Why are the tips of my fern turning brown? I've only had the plant for a few weeks. It needs more humidity. Either mist it regularly or set it on a pebble tray with water in it to raise the humidity around it. You can remove the brown tips.